The stereo microscope is a low power microscope that uses several lenses to arrive at the total magnification. HSZ6-TBL stereo microscope is shown above. Every stereo microscope derives its total magnification from a combination of the eyepieces and the built-in objective lens. Eyepieces are typically 10x magnification, although they are occasionally 15x or 20x. The built-in objective lens can be single (1x for example), dual (2x and 4x for example), or zoom (1x-4x with every magnification in between). If you combine the above two items, you will find the total magnification of the stereo microscope. The eyepieces will generally have an inscription on them such as WF10X/20. This means the eyepieces are 10x magnification with a 20mm field of view. The objective lens value is typically printed on the edge of the objective, or on the zoom knob on the side of the microscope. If it says 1x-4x, then your total magnification with 10x eyepieces would be 10x-40x. 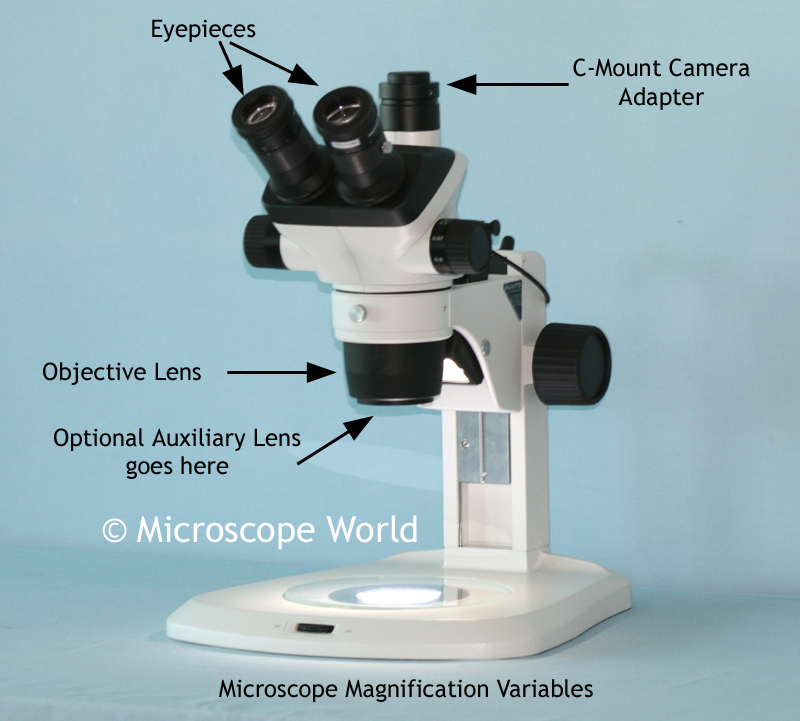 There are a few other options for manipulating total magnification on a stereo microscope. An optional auxiliary lens can be screwed onto the bottom of the objective lens on most stereo zoom microscopes in order to increase or decrease total magnification and working distance. Typical auxiliary lens magnifications include 0.5x, 1.5x, or 2x. With the above mentioned microscope setup of 10x eyepieces and a 1x-4x built-in objective lens, if you added a 1.5x auxiliary lens the total magnification would become 15x-60x. Finally, the c-mount adapter affects the magnification of the camera. Most of the time it is easier to use the microscope if the image seen through the eyepieces is the same magnification that the camera sees. This is accomplished by matching the microscope eyepiece magnification with the pairing of the magnification in the c-mount adapter with the chip size in the camera. There is a chart on this page that explains matching c-mount adapters with image sensors.